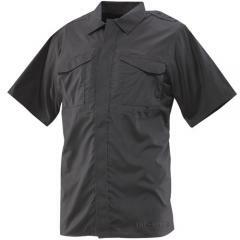 The "Gunny Approved" 24-7 Series Ultralight Short Sleeve Uniform Shirt from Tru-Spec is an exceptional choice for duty wear. The breathable polyester/cotton blended ripstop fabric is highly durable, perfect for active outdoor or law enforcement use. Bellowed front pockets expand to accommodate plenty of small items and feature hook-and-loop flaps for greater retention. The hidden document pockets allow for discreet carry of sensitive materials. A pen/pencil stall allows for convenient and ready access to writing implements. The bi-swing back provides exceptional freedom of movement for the shoulders, allowing for a comfortable firing stance without any restriction. Best shirt I have ever owned by lot of pockets nice material.